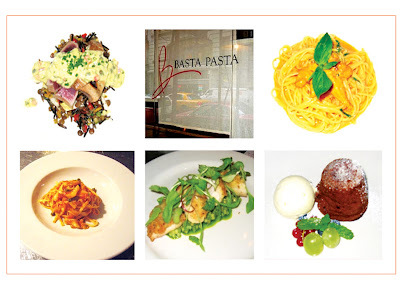 Being a true fan of Iron Chef, I just love the ambiance and concept of Basta Pasta. Open the door and enter a mini version of the infamous Kitchen Stadium. A squeeky clean open kitchen, with steel appliances, pots and pans of all sizes and shapes, condiments, fresh ingredients and chef and su chefs in white working away like bumble bees. There’s no battle between chefs, but a mission to satisfy every diner, while a mix of apetizing aromas fill the space. There’s no need to stuff oneself with loads of carb, the menu offers an extensive array of dishes, from antipasti, to primi piatti (pasta), sedondi piatti (protein) to griglia (grilled meat and fish). The portions are just right and the best part is, you can order small portions of the pasta, which I love. It gives me room to taste a variety of dishes. As antipasti, I really enjoy the Prime Tuna “Tataki “ with original wasabi tartare sauce, served with cucumber and tomato salad. It’s fresh, slightly creamy with a little kick. The tuna melts in ur mouth, and the veggies give out that extra crunch. The Black Mussels & Clams, steamed in garlic and white wine is also very good. Don’t forget to taste the broth with pepper flakes. It’s sweet and a bit spicy. A great way to start any date *wink*. The Grilled Squid, leek and okra, with mullet roe, endive, pistachio and tomato salad is another tasty choice. But I can be bias on this one, simply because I love squid. Now to the main event, the PASTA, aka “primi piatti”, this is why I go there for. If it’s your first time, I would recommend the Spaghetti with Parmigiano Reggiano and Parma prosciutto, served at your table, the spaghetti is tossed inside a half a wheel of Parmesan cheese, it’s just fun to watch, not to mention the taste. It’s creamy and extra extra cheesy with a hint of saltiness from the prosciutto! Trust me, you’ll enjoy it. Thank me later. All the pasta are really tasty, the flavors are matched perfectly, with fresh ingredients and always al dente. BUT MY FAVORITE IS THE LINGUINE with FRESH SEA URCHIN and basil in pink sauce!!! yuuummm!!! It’s sooo good! I love sea urchin(UNI). So what better way than to enjoy it hot and steamy with pasta and pink sauce!!! Sooo creamy, sweet and delicious! I can never order anything else, nothing can replace it. Usually by now, I’m ready for dessert. But the fish are quite delish if your still hungry. Just remember to leave room for dessert! The Melting Chocolate Inside, served with vanilla gerato is a perfect way to end the meal. Anything with chocolate is good, so i give it thumbs up. Their Almond Flan, homemade gerato are also quite a treat! Sweet indeed.